Four men have been convicted over a phone scam carried out across the south of England that defrauded 18 pensioners out of a total of £600,000. 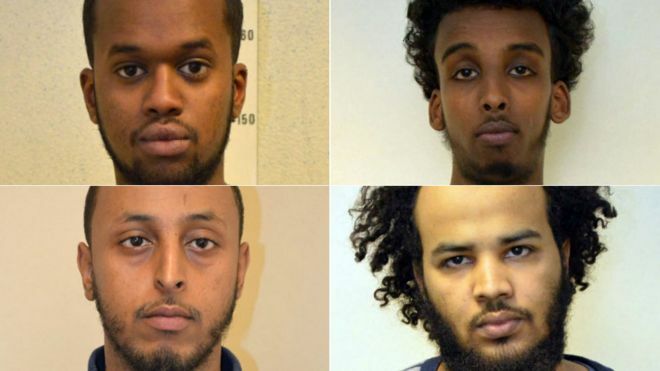 Mohamed Dahir, 23, Sakaria Aden, 22, and Yasser Abukar, 24, were found guilty of conspiring to commit fraud. Mohammed Sharif Abokar, 28, was convicted at the Old Bailey of converting criminal property. All four are from north London. The scam involved gang members posing on the phone as police officers. A fifth man, Ibrahim Farah, 23, also from north London, was acquitted of conspiring to commit fraud. The Metropolitan Police said the fraud was uncovered after a separate terrorist investigation found payments in a bank account used by someone who later travelled to Syria. The trial heard how the victims - aged in their 70s, 80s and 90s and from Cornwall, Devon, Dorset, Bedfordshire, London and Kent - were phoned by men posing as police officers supposedly investigating a fraud at the person's bank. They were advised to transfer money or hand it over for "safekeeping". The so-called "vishing" scam - or voice phishing - was carried out between May 2014 and May 2015. Three other men had already pleaded guilty to conspiracy to commit fraud before the trial started. Two others had admitted converting the proceeds of crime ahead of the trial. Pretending to be police officers, the fraudsters would phone an elderly person's home and lie to them that their bank account was being defrauded and they should call 999 or their bank's fraud department. What the victim didn't realise was that the fraudsters stayed on the line after they hung up. The elderly people who thought they were reporting crime were in fact speaking to the criminals. The pensioners were instructed to go to their banks and withdraw or move thousands of pounds of their savings. Dahir's defence barrister Patrick Harte told the court his client had a letter from Labour leader Jeremy Corbyn "setting out his roots in the area" of Islington. The letter had been sent as part of Dahir's earlier bail application, Mr Harte told the press. Judge Anuja Dhir QC remanded all four convicted men in custody ahead of sentencing on a date to be fixed in the new year. Patricia Burnham, 76, handed over £135,000 before she realised she had been duped. "I just felt devastated, stupid, embarrassed, you know, how could I have been so taken in?" Commander Richard Walton, of Scotland Yard, said: "These criminals were targeting individuals who were vulnerable and elderly - in their 70s, 80s and 90s - you know, to be honest, the targeting of individuals like that in our society like that is frankly beyond belief." Kevin Dent has built up a wealth of experience over 20 years in fraud and serious crime, and is often instructed as leading counsel. The core of Kevin’s practice is fraud, revenue evasion, money laundering, and healthcare frauds. Kevin is often instructed in multi-million pound fraud cases involving large volumes of complex material calling upon Kevin’s keen eye for detail.